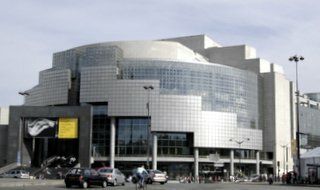 In 1982, President François Mitterrand created l'Établissement Public Opéra Bastille (the Opera Bastille Public Establishment), whose function was to produce a new opera building, with performances reasonably priced, a "people's opera house". In 1983, the Establishment conducted an international architectural competition. On November 10, 1984, the architect chosen among the 1,700 applicants was Canadian-Uruguayan Carlos Ott. The site of the new opera house was decided to be Place de la Bastille. However, to begin construction in 1984, the Bastille train station of 1859, defunct since December 14, 1969, and a temporary art exhibition hall since then, had to be demolished. The Opera Bastille, home of the National Opera of Paris, is a massive, curved, glass-exterior structure, 80 meters high, with another 30 meters below street level. Each level consists of 22,000 square meters. The main auditorium of 1,200 square meters, has a seating capacity of 2,700 and each seat has an unrestricted view of the stage. The main auditorium is 20 meters high, 32 meters deep, 40 meters wide and has a glass ceiling. The orchestra pit is mobile and adjustable and it can be covered. At its largest, it can hold up to 130 musicians. The main stage is 45 meters high, 30 meters wide and 25 meters deep. It has 9 elevators which allow for several levels to be created. The three main elevators bring scenery up from below the stage. There are 4 storage areas of the same dimensions as the stage, used for rehearsals and the backstage area has a scenery turntable, which allows the opera to stage two productions concurrently. The building also has workshop rooms that are used for productions here and at the Opéra Garnier. The Opera Bastille is mainly used for grand-scale operas. However, it does occasionally stage ballets, though, the main stage for ballets is now the Opéra Garnier. For the smaller events, such as chamber music and recitals, the Opéra Bastille provides two smaller performance stages. The Amphitheatre has an area of 700 square meters, with a depth of 21 meters and has a seating capacity of 450. The Studio holds 237 seats in an area of 280 square meters, with a depth of 19 square meters. There are guided tours of the Opera Bastille available for both individuals and groups. The tour includes a visit to the public foyers, the main auditorium and the backstage areas. It lasts approximately 75 minutes and is given almost every day, usually at 1 p.m. or 5 p.m. The tours are in French, but groups can arrange for English tours. Ticket prices for an adult is 10 euros; for those over 60 years of age it is 8 euros and for students and those under 26 it is 5 euros. Tickets are sold 10 minutes prior to the tour at the Opéra Bastille box office. During the summer, however, the Opéra Bastille tours are not available. For further information, go to the Opera Bastille website.